Dubai, United Arab Emirates, 14 January 2019: Dubai Land Department (DLD) welcomed a US real estate delegation yesterday comprising several governmental and private institutions in response to an invitation sent to brokers, developers, licensed real estate agents, and a large number of investors to visit Dubai. 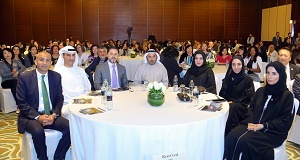 The visiting delegation included more than 150 real estate agents and 11 investors who will review the investment opportunities offered by Dubai and its exceptional investment climate. The visiting delegation was given a detailed explanation of Dubai’s real estate sector and the real estate legislation through the “Certified International Property Consultant (CIPC)” course. The delegation then went on a tour of The Sustainable City (TSC), the first-of-its-kind residential community in Dubai to implement sustainable urban standards that conserve the environment by adopting a sustainable environmental approach in producing clean energy and giving priority to green areas. The delegation expressed their admiration of the international academic standards adopted by DREI and the services it provides to qualify real estate brokers in the UAE and the region as well as provide its members with the opportunity to obtain the appropriate academic qualification according to the highest international standards. The delegations also commended DLD’s dedication and efforts in promoting the real estate sector and highlighting the diverse projects offered by developers, evident during their visit to TSC, which is a model of excellence in Dubai’s real estate sector. During their visit, the delegation will review a number of developers’ real estate projects in the coming days as a result of a cooperation between DLD, the US real estate promotion trustee, Aqari Global Ltd, and Century 21 UAE. It is the first-of-its-kind initiative to promote Dubai’s real estate market to attract investors and real estate brokers from the USA and the world, encouraging them to visit Dubai and invest in real estate. DLD recently recorded a unique presence as a global strategic partner at the American 2018 REALTORS Conference & Expo (NAR) in Boston, USA. The visit is complemented by the promotional programme adopted by the Real Estate Promotion and Investment Management Sector at DLD to contribute to attracting investment from the US market to Dubai’s real estate market.